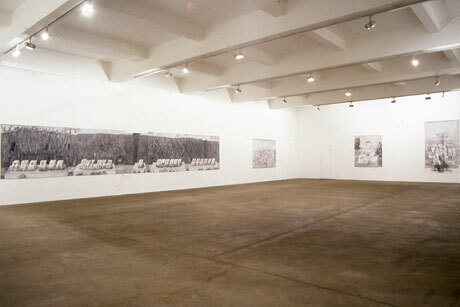 The first gallery showing of Nobson Newtown was at Chisenhale Gallery in East London in February and March of 1998. I usually enjoyed the shows at the windowless, cement-floored, bunker-like space in the 90s, but I was particularly intrigued by this exhibition. 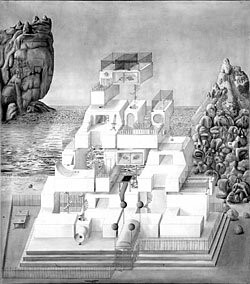 There were about a dozen drawings divided between the four walls and I remember crisscrossing the room to view and to re-view each tantalising vision: soaking up the detail on the one hand, searching for an overview on the other. 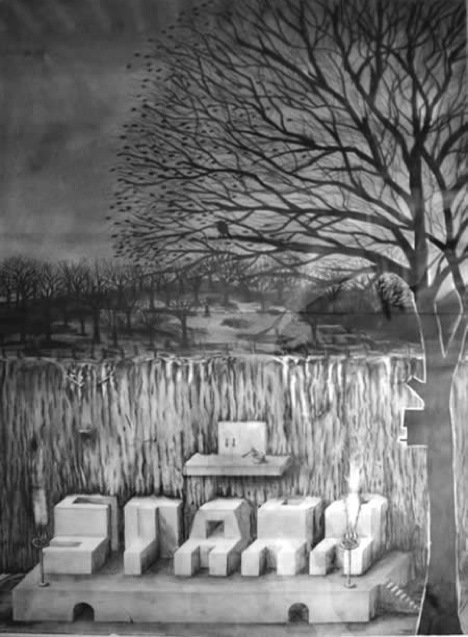 I can’t actually recall the layout of the show, but the above image from Chisenhale Gallery’s archive suggests that Nobspital and Paul’s Palace were shown against the east wall (on the right). I do seem to recall that Nobslum, one of the drawings that first attracted my attention, one of the earliest drawings to be completed, was on the west wall, out of the above shot. On the day of my gallery visit, I bought the little book that had been published to coincide with the exhibition, and I have it on my desk in front of me as I type. The long painting in the middle of the north wall is Quarry. Blocks of stone (nobrock from the Nobhill Downs that surround the seaside town on its non-sea sides) have been made into the block letters A, B, C, D, E, F. Then there is a strip from G to M. Then N stands on its own, standing of course for the all-important Nob. the alphabet is finished via two more strips of letters. 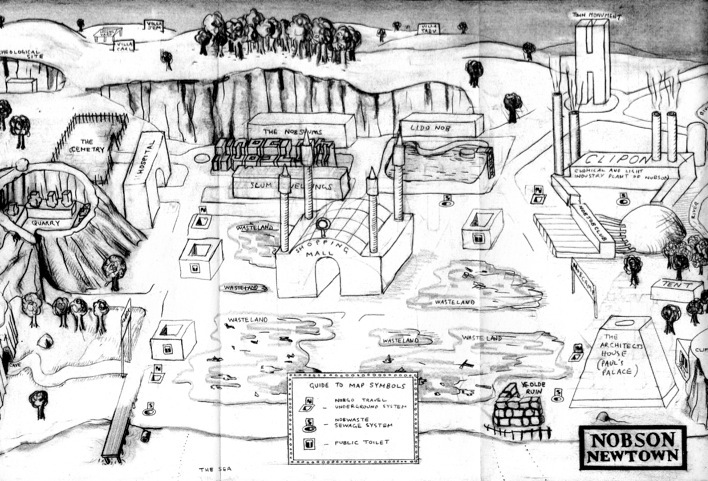 I can see now that this is an important drawing, central to the artist’s vision, showing the viewer that the houses of the town are made both from local stone and letters of the alphabet. I haven’t seen the work since. I wonder in which enchanted space it hangs now. 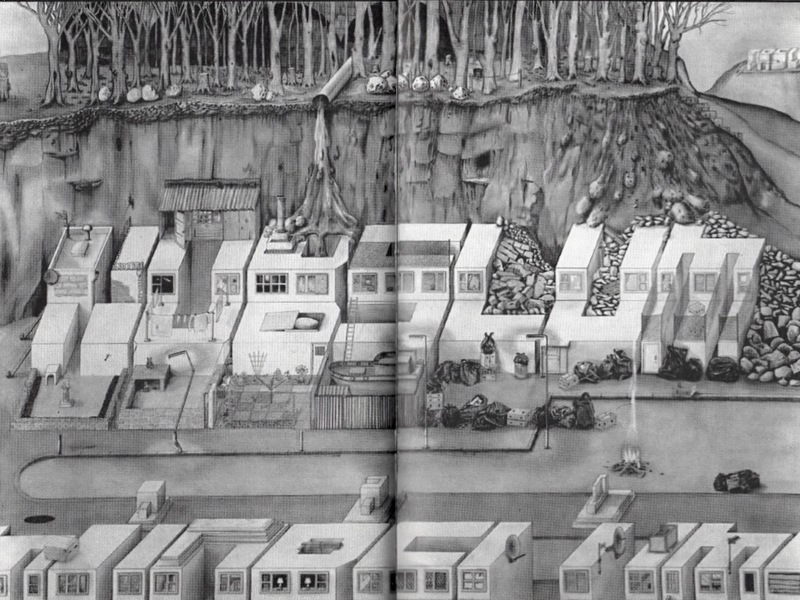 ‘The artist’s book produced for the Chisenhale show begins with a map indicating that the centre of the town is a shopping mall surrounded by a puddle-strewn wasteland. Luckily the town is served by Nobgo Travel underground system, not to be confused - as it easily is on the map - with Nobwaste sewage system. The book’s deadpan style is at first reminiscent of Nathan Coley’s Lecture, where the self-congratulatory tone of an architect’s voiceover distracts the viewer from realising that the slides being shown are of unadulterated urban blight. ‘No pubs, sports centre, art gallery, cinema or leisure facility of any kind, except a lido. Only within the fenced confines of Paul’s Palace there is a choice of recreational   facilities. In clear view is a trampoline, skateboard ramps, a basketball hoop, an easel and a table-tennis table. But what good is a table-tennis table without someone to play? And there is no-one to play with: the town is deserted. So that’s what I wrote back in 1999. Pity about the self-indulgent flourish at the end, but I was younger then. What do I think in 2012? A catalogue that the Whitechapel Gallery published in 2004 tells us that Paul Noble was brought up in Whitley Bay on the north east coast of England. There is a building in the seaside town, called the Spanish City whose dome echoes that of Nobjobclub, as the artist points out in a recent interview in the Evening Standard. Yes, I mustn’t forget that while the Nobson Newtown project is partly concerned with a critique of society and human nature in general, it’s also an excavation of memory, an exploration of one person’s experience. 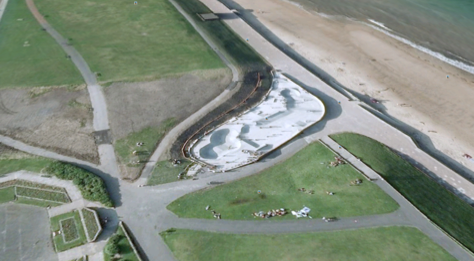 This aerial shot of the sea front at Whitley Bay brings to mind Lidonob, a drawing made by Paul Noble in 2000. In the Whitechapel catalogue, the artist includes a page of photographs he’s taken which he refers to as ‘Seafront houses in Whitley Bay’. It’s possible to track these down using Google Earth. The row in question consists of four semi-detached houses. The eight dwellings do not make a slum, not by a long chalk, but the row does bring to mind Nobslum, with gleaming cars taking the place of bags of garbage. 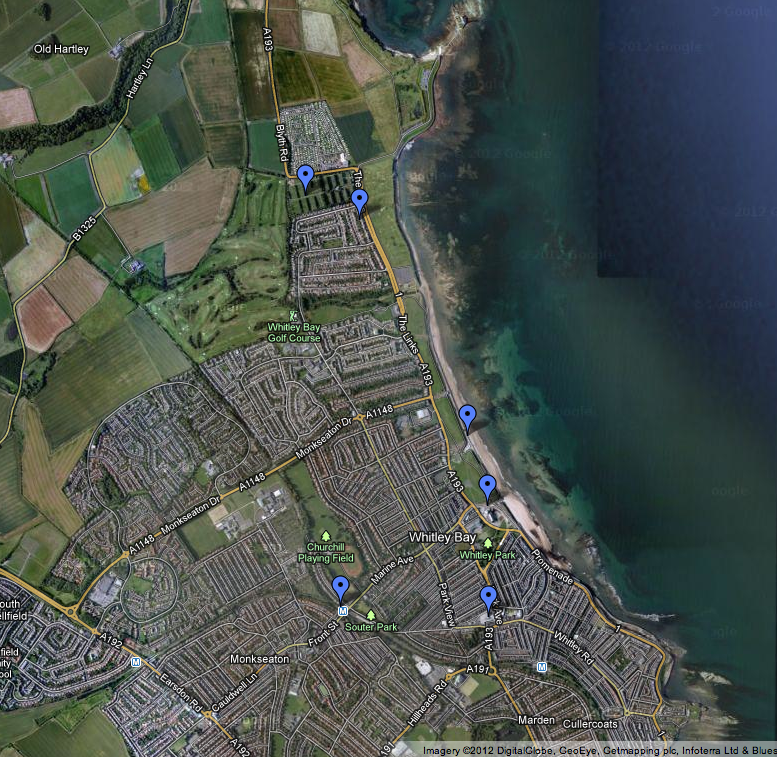 Below is a map of Whitley Bay. The blue tacks mark, from north to south, the cemetery, the seafront houses, what I take to be an outdoor swimming pool, the Spanish City, the Metro (Nobgo) and the shopping mall (actually that dates from 2004 so can’t be a direct inspiration for Mall). In addition, North Tyneside Hospital (Nobspital? ), West Allotment Country Park (Nobpark?) and Tyne Tunnel Trading Estate (C.L.I.P.O.N.?) can be found just off the south border of this map. Paul’s Palace? I don’t know where Paul Noble lived when he was growing up in Whitley Bay. Nor do I know about the friendships with Trev, Carl and Jem that may have fed into Villa Jem, Villa Trev and Villa Carl. I don’t feel I need to. 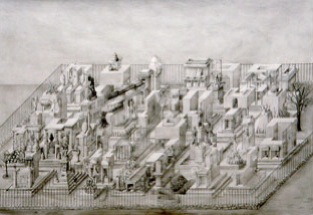 The drawings work on various levels. 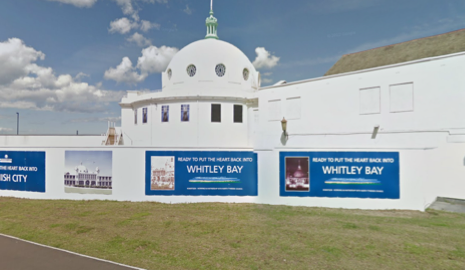 They worked very well for me before this virtual exploration of Whitley Bay. Having said that, sooner or later the more personal links will be investigated and written about by someone. The link between biography and ouevre fascinates many. If one thinks a work of art is inspired and original, one wants to find out what’s behind those unusual qualities. It’s what took me up the Amazon in the footsteps of Evelyn Waugh. Well, no, I confined my research to the author’s British haunts. There are limits. If I was writing my 1999 article about Nobson Newtown again now (which in a sense I am), I wouldn’t make so much of the solitary existence of the town’s architect. From 1988 to 1998, Paul Noble was one of five artist friends who ran City Racing near the Oval in south London. City Racing hosted any number of great shows - I remember seeing work by Jemima Stehli and Kerry Stewart there for the first time - but the list of artists associated with the place at an early stage in their careers is truly impressive. Paul Noble: not a tyrant aloof in his palace at all then (not that I ever really thought he was), but an artist constantly communicating with other artists. One of those artists tells an anecdote on her website. A few weeks after contributing an audio tape to a group show at City Racing in the spring of 1997, Georgina Starr heard that someone at the gallery had made a bootleg copy of the piece. Subsequently, she got a letter from the bootlegger apologising for his action, saying that he wanted to hold on to the tape and to give her a piece of his own work in exchange. A month later Paul Noble arrived at her studio with The Obscure Temple of the Starr Cult Beyond Nobson Newtown. In the foreground of Starr, there is a tree in which a bird is perched, directly above the archaeological STARR. On the trunk of the tree hangs a nest-box. I think if the drawing had been part of the Chisenhale show, this viewer would have been tempted to imagine the bird flying the length of the gallery - as far as the open grave in the drawing, Nobsend. The bird (a robin, perhaps, the only British bird that sings throughout the autumn) could then have happily picked worms from the pile of loose earth by the empty grave, content in the knowledge that its new friend was safely tucked away in the nest-box; still above the ground; still putting together its complex vision of life on earth. 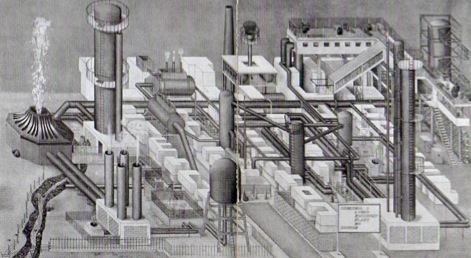 Strange to think that in the seventeen-odd years since the first Nobson drawings, things have changed so much. There were no personal computers back then, just pencils, typewriters and worms. Now Google and Apple are inundating our senses. But that doesn’t mean the pencils have gone away. Or the worms. If any copyright holder wants an image altered/removed, or the rights information to be displayed differently, they should get in touch.